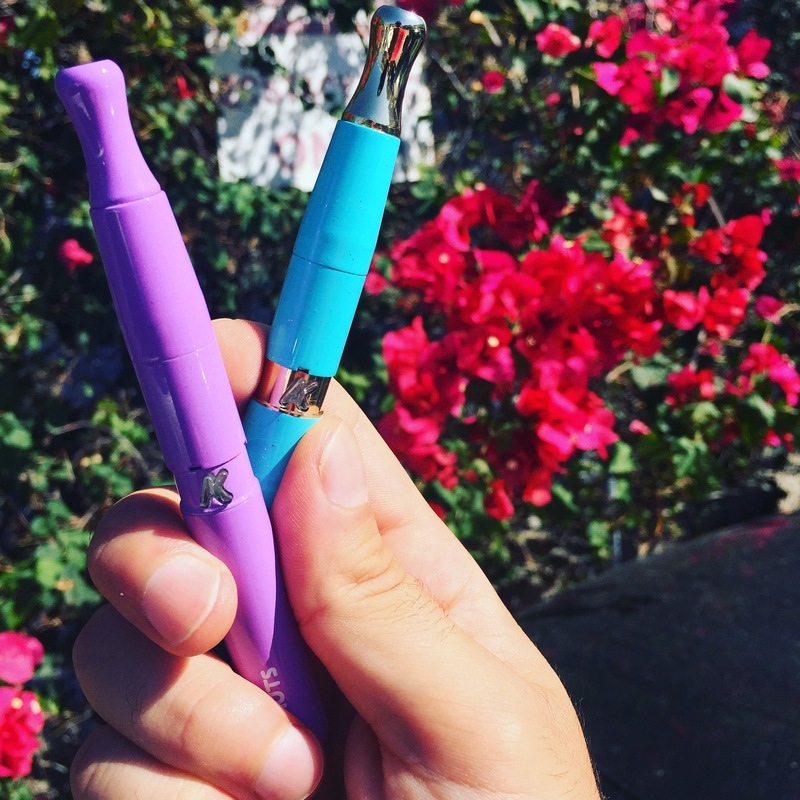 The Donuts and the Galaxy are two of the newest wax pens from KandyPens. While most wax pen vaporizers function in pretty much the same way, both of these units have some pretty cool new advancements that are fairly unique. We’re anxious to see how they hold up to the competition. Let’s take a look at both and see how they perform. 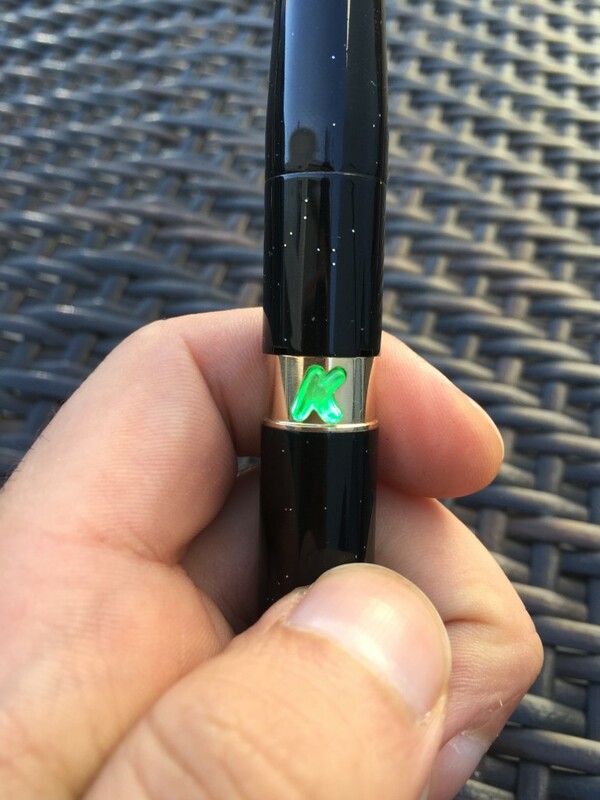 KandyPens have been producing some really stellar units as of late, which are all backed by an unprecedented, industry leading lifetime warranty. With that said, we were pretty excited to get our hands on KP’s latest releases: the Donuts and Galaxy. Both of these units are for wax concentrates and feature temperature control batteries (something unique among wax pens), as well as cutting-edge atomizers (which are interchangeable between both units). The Galaxy and Donuts are essentially the same exact unit, aside from the paint job and type of atomizer included with each (something we’ll cover in the Atomizer portion of this review). The Donuts is more simple looking, as the whole unit is one solid color with a glossy finish. 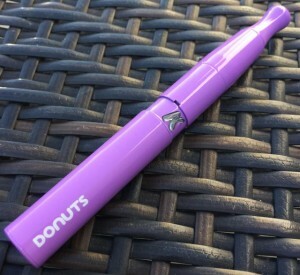 The name ‘DONUTS’ is branded on the battery, and the power button is in the shape of the KandyPens ‘K.,’ which is backlit by one of three colored lights (red, green or blue), depending on which temperature setting is selected (something we’ll also cover a bit later in this review). The Galaxy is also glossy, but has more of a “sparkle” finish and features gold accents. There’s no branding on the outside of the Galaxy aside from the same ‘K’ shaped power button that’s on the Donuts. Measuring 5 inches in length, both the Donuts and Galaxy are about the same size as most other penstyle vaporizers. Both units can be disassembled into four different parts: the battery, atomizer, chamber connector and mouthpiece. The mouthpiece is rounded off at the top, which is a nice changeup from the usual flattened tip. While there’s probably no advantage to being rounded, I do like it for the simple reason that it’s different. As someone who spends a lot of time vaping and reviewing different units, it’s just nice to see small tweaks in design like this. One of the first thing you’ll notice about these units after pulling them out of their included hard shell carrying cases is the overall build quality. Constructed from anodized aluminum, these little guys are SOLID. When compared to the competition, the Donuts and Galaxy feel much more substantial and well put together than any other wax pen I’ve used. I’ve always held the Dr. Dabber Ghost and Source Orb in very high regards as far as build quality, but I must say, the Donuts and Galaxy just feel more heavy duty, and seem like they’ll be able to handle some serious everyday use. Another nice thing about these units is all the pieces screw together very easily and securely. Everything feels like it was punched out with machine precision, which is not always with the case with these types of devices in the past. I can remember when the flat, ellipse style wax pens first came out, it was either insanely difficult to change atomizers because they fit so tight, or the thing would fall right out because it was too loose. For that reason, I really appreciate the attention to detail. OK. Here’s where the Galaxy and Donuts set themselves apart from standard wax pens. Starting with the Galaxy, which utilizes a quartz crystal rod dual-coil design within a quartz crystal-lined chamber. While we’re seeing a lot more quartz crystal being used in the vapor path of some portable herbal vaporizers, we’ve yet to see any penstyle vape incorporate this technology. So what’s the advantage of using quartz crystal rods over traditional ceramic rods? The answer to that is simple: taste. Quartz crystal is pure – much more so than ceramic or fiber wicks. Glass won’t absorb excess heat from the coils, thus, quartz rods will never turn that burnt brown color, and will look brand-spanking new every time you go to load up the chamber with a fresh dab. With ceramic and fiber, there’s always residual wax being left over and absorbed into the rod or wick, which then burns-off the next time you use the pen. So, if you think about it, you’re never getting the true taste of the wax – instead, you’re always inhaling remnants of dabs past. Some people won’t appreciate the sophistication of the Galaxy’s atomizer, since when you load wax onto the dual-coil quartz rods, your wax is going to heat and burn just like it would with any other atomizer. However, I’m confident that true dab connoisseurs will taste the difference right away. And more importantly than tasting the difference right away, is tasting the difference down the line after continued use. Session after session, dab after dab, each hit will taste as smooth and pure as it did when the atomizer was brand new. Onto the Donuts, which goes a completely different route than the Galaxy. The Donuts atomizer is exactly that: a flat ceramic dish that free of wicks, rods or coils. Instead of focusing on taste by utilizing quartz crystal, the Donuts atomizer is all about wax conservation and minimal combustion. These “deep-dish” atomizers use what KandyPens calls SloBurn™ Technology. In comparison to coils, which flash-heat and often end up burning concentrate material, Donuts’ ceramic dish heats up much slower and never comes into direct contact with a red hot coil, meaning you’re coming about as close as you possibly can to a combustion free dab experience, which is pretty much unheard of. More so than the Galaxy’s quartz crystal atomizer, I think the Donuts wickless/coiless design will appeal to a broader audience, as I feel like more people are concerned with conserving their concentrates than the overall taste (which I don’t necessarily agree with, but oh well). When placing a dab into the Donuts’ deep chamber and onto the dish, first thing you notice is how fricking big the chamber is! You can fit a TON of wax into this thing. I personally prefer loading small amounts at a time, but hey – if you’re so inclined, go nuts. When you press the button to heat the dish, you’ll notice it doesn’t turn burn red hot like a coil would or start instantly burning your wax. Instead, the ceramic dish heats up slowly and to a much lower temperature than coil atomizers. This cause the wax to bubble and stick around in the dish a lot longer before it vaporizers into oblivion. Since it’s a much slower burn, sessions will last a lot longer, and you’ll be able to get a lot more out of your dabs. Replacement atomizers for both the Donuts and Galaxy retail for about $20 each, which may seem a tad pricey – but remember, these aren’t your run-of-the-mill single-coil wicked atomizers. High-end components and superior build quality justify the slightly higher price tag in our eyes. The feature of the Donuts and Galaxy that really brings everything home for me is the temperature control battery. To my knowledge, this is something completely new and different when it comes to wax pens, as with most units, you just load your wax and press the button to heat. You never really know what temp you’re heating to, and casual dabbers generally aren’t that concerned. However, for more advanced users, heat level is actually a big deal. Having the option to select between three different temp settings (350°, 390° and 430°F) allows for a high level of customization, and adds a cool new element to wax pen usage. Per usual, clicking the power button five times unlocks the battery and turns on the unit. By default, the Galaxy and Donuts are both set to 350°, indicated by the ‘K’ button displaying a red light when pressed. In order to toggle through temperatures, you press the button three times consecutively. Important to note, there’s a bit of a technique to this. It takes a second for the display light to change colors after pressing the button for the third time. I kept trying to start another series of three clicks too quickly, which would end up turning into five clicks, thus, turning off the unit. So to avoid said frustrations, click the button three times, then pause. Don’t be overzealous. The display light will change color. Just hold your horses. So, after three clicks (and a pause), the ‘K’ backlight changes from red to green, indicating the second heat setting of 390°F has been reached. One more series of three clicks, and the light changes from green to blue, which is 430°F, the highest heat setting. Obviously the higher the temp you select, the faster your wax will burn and the larger your clouds will be. The lower the temp, the smoother the hit and the lighter the vapor. Like the KandyPens K-Vape, I’m vexed by the their choices for temp display light colors. Blue being the highest and red being the lowest is totally counter-intuitive, and makes me feel like I have color dyslexia or something. Not a huge deal, but certainly an oversight by KandyPens. While the differences between temps are subtle during actual usage, I still think it’s a really cool feature which I haven’t seen before. 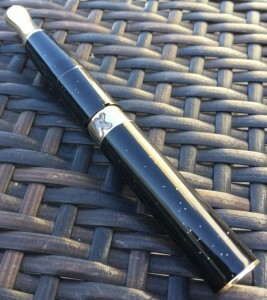 I know the Source Orb utilizes a variable voltage battery, which I’d imagine serves the same purpose, however, I feel like KandyPens marketing it as ‘temperature control’ instead of ‘variable voltage’ is the smarter way to go, as it makes it sound less like an electrical engineering term, and more like something that the everyday dabber can understand and appreciate. 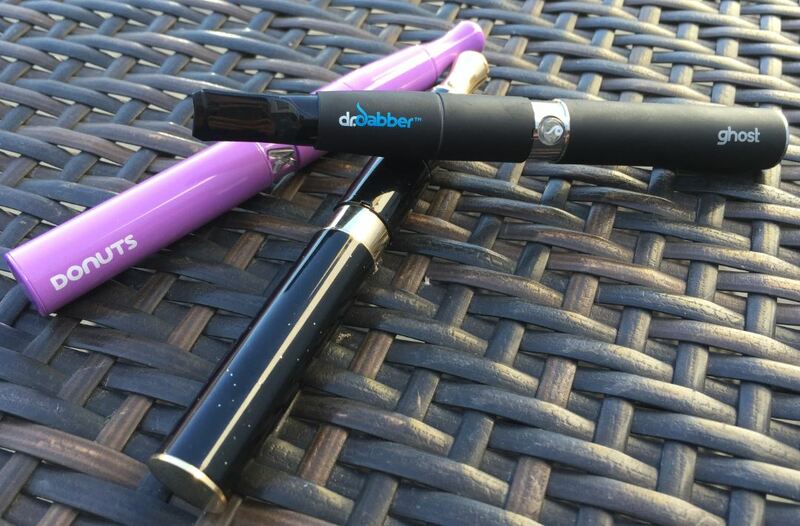 Up to this point, my go-to wax pens have been the Dr. Dabber Ghost ($85), the Source Orb ($80), and the SToK R ($50). I’ve had the Ghost the longest, and have nothing but great things to say about Dr. Dabber and their products. The Ghost was one of (if not the first) pens to use low-heat Titanium coils, which is now pretty common. The Galaxy also uses Titanium coils wrapped around quartz rods, compared to the Ghost which uses ceramic rods. Even though I have a ton of love for Dr. Dabber, the Galaxy has better build quality, more advanced atomizers, and a lifetime warranty on its temperature control battery. I’d say for just $15 more, the Galaxy ($100) is a better investment. There’s actually a lot of similarities between the Source Orb and the Donuts/Galaxy pens. 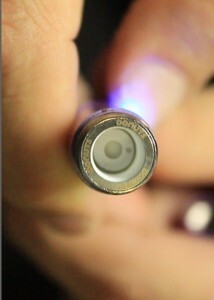 In fact, Source actually beat KandyPens to the punch when it comes to ceramic ‘donut’ style atomizers. The Source Terra atomizers are pretty much the same as the KandyPens’ Donuts (KandyPens are just marketed better). Additionally, Source recently released Quartz crystal atomizers for the Orb, although I think KP was first on that one. The Source has a variable voltage battery, which will essentially serve the same purpose as the Donuts and Galaxy’s temp control battery. All of these units have great build quality and unique styling. With the Orb, you get eight different atomizers, including their Terra ceramic dish atomizer and a couple different Quartz atomizers. Considering you get all that with the Orb for $20 less than the Galaxy and Donuts (which only come with one atomizer), this one seems like a no-brainer to me. The last comparison we’ll do is with the SToK R pen. The SToK is a great value for just $50. It has a really unique design with a Polycarbonate visual heating chamber, which allows you to watch you wax bubble and see your vapor build. The SToK R also uses high-quality Titanium and ceramic components. The one thing I don’t love about the R Series is the atomizer, which is just a standard single-coil wicked. The SToK performs really nicely though, despite its shortcomings in the atomizer department. However, even though the Donuts and Galaxy are twice the price as the R, I consider them better investments overall. While it’s big on performance, the SToK’s atomizer and 1 year warranty leave a little to be desired. With that said, if you’re ballin’ on a budget, the R Series is still a great choice. But if you have the means, you’re going to want to go with the Donuts or Galaxy on this one. Priced similarly as other high-end pens, the quality, innovation and functionality that both of these units bring bring to the table is better than that of the competition. We recommend purchasing through the Donuts and Galaxy from our preferred retailer. They always throw in some additional goodies and ship for free. Both the Galaxy and Donuts perform on a high-level, and feature some of the best build quality in the business. We’re all about the advanced atomizer designs and components, along with the temperature control battery. Considering the battery is covered by a lifetime warranty, these pens are a phenomenal value. We highly recommend the Donuts and Galaxy to all the dabbers out there. since the battery is 510 threaded, can I use it to connect a vape oil cartridge? Yes, you can use this battery for one of those pre-filled vape cartridges. It might look a little weird because of the size difference, but you could vape with it. Love the blog. You have so many informing posts. I’ve been in the dab game awhile, but I’m not digging the whole butane torch and nail situation, thus I want to invest in a pen. 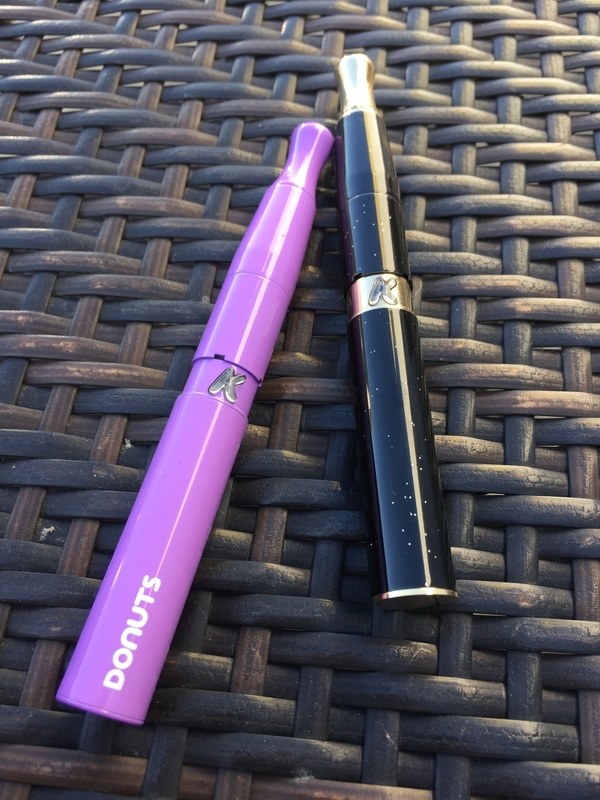 I am deciding between the Kandypen Donut or Galaxy. I have read your review, but I was just curious which you thought was a better fit for me. I am a recreational smoker, a handful of times of day and pretty mobile. I do enjoy taking bigger rips, but if the Donut still gets the job done I don’t care what the size of my hits are. I would appreciate it if you gave me some insight before I purchase one of these. Thanks in advance. Thanks for the love Jerry. While I personally prefer the Galaxy, it honesty doesn’t matter which you get, because the atomizers are compatible with both batteries. I would just base your initial decision off which color/design you like the best. The donuts are a little more basic, and the galaxy have more of a flashy finish. If you end up choosing the Galaxy, you can get a Donuts atomizer to go along with it – or vice versa. If you are tired of torch and nail, try an electronic rig. They can be a bit pricey, but if you ejoy dabs, they are second to none. Being able to take back to back to back hits without any drop in temp is pretty nice.